Anaga is in our opinion one of the most beautiful and mysterious places in Tenerife and we really wanted to explore it more on foot, especially the laurissilva forest. The laurel forest is a type of subtropical forest found in areas with high humidity and relatively stable and mild temperatures. Combined with the fact that Anaga is the oldest part of Tenerife, this region is one of the most interesting places to visit on the island, but you do have to think ahead and be prepared for the visit. El Pijaral is an Integral Nature Reserve and you need a permit in order to be able to go through the forest, otherwise there is a 600 Euros fine if you are caught in the forest without one. The access to the forest is very limited and only 45 visitors per day are allowed. You need to reserve a permit online well ahead of time, as these do go out fast, especially in the summer months. The permits are free and you need to book online on the page Central de Reservas pertaining to Cabildo de Tenerife. You can book with a maximum of 90 days ahead of the day of your visit. The website is only in Spanish but you can use Google Translate, or you can simply choose the date and then complete the info in the online form (it is pretty easy and intuitive. You can book for several people at one time). After you book make sure to print your permit and have it with you on the day of the hike. You will need a car if you want to do this hike. From the South of Tenerife it's almost a 2 hours drive to the point marked on Google Maps as Bosque Encantado (La Ensillada). We drove from Puerto Santiago and it was really a 2 hours drive, so make sure to plan ahead your day. There is a small car park on the left of the road and you can leave the car there and start the hike. We did this hike in February and at 11:00 in the morning when we arrived there was only one other car in the car park, but we've read that in summer it gets busier and it can be more difficult to find a place to park. This is a circular hike in Tenerife, which means that you will end back to the starting point by following a circular path. Once you start your hike through the forest you will quickly understand why it's called The Enchanted Forest. This vegetation is old and it forms a landscape that is filled of mystery and enchantment. El Pijaral (the name of this trail) is actually a fern that can exceed 2 meters in length and you will see it all throughout this hike. 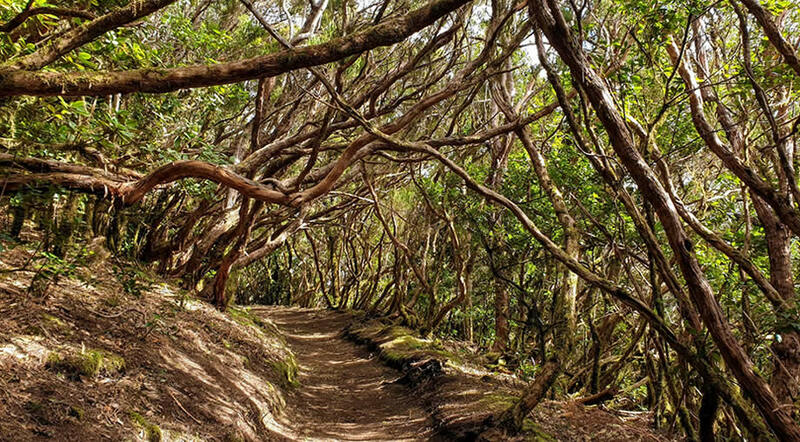 In order for the laurissilva forest to survive it needs moisture all year round, which is why it thrives in the specific micro climate of Anaga, characterized by the alisios winds and the sea of clouds (mar de nubes). Once you get out of the forest you arrive at the Mirador Cabezo del Tejo, where you will have an amazing view towards the coast, Taganana and the beaches of Anaga. We were extremely lucky to go on such a sunny and warm day in February, as we've seen that on some days the valley is covered by a sea of clouds so dense that you can't see anything of this amazing view. We spend more than 30 minutes here admiring the view and the beautiful birds, while having a picnic and resting. The rest of the road from the mirador and park to the car park does not require a permit anymore and you can come to the mirador on the route that we took to get back to our car. Actually, if you drive from the first car park where we left the car for a few more kilometers, you see another car park on the left and you can park there and go on the trail that will lead you to the Mirador. This part of the hike is fairly easy and plane and doesn't require much effort. So from the Mirador Cabezo del Tejo we followed the signs and went on the trail that eventually took us to this second car park, from where we entered the forest again, in order to get back to our car. The hike through the forest has many ups and downs, so it is an intermediary level hike. There are various points on the route through El Pijaral where you get to see the Roque Anabro, a distinctive and famous rock formation in the area. This was a great hike in Tenerife, one of the most unique experiences on the island, since we got to see first hand a type of forest that is nowadays very limited around the world. If you are passionate about nature and hiking then we definitely recommend that you plan ahead of time and reserve a permit for El Pijaral. And if you don't have a permit, leave the car at the second car park and go on the walk to the Mirador, especially if it is a clear and sunny day - the view is simply breathtaking and the entire Anaga forest is a wonderful place to visit, not to be missed when coming to Tenerife. take great care of the nature around you and help preserve it for generations to come. This is a Nature Reserve, which means that it is a protected space that should be enjoyed without leaving anything behind. We will never understand why people feel the need to carve their names on tree trunks or aloe vera leaves, but we ask you to be respectful of the nature around you and simply admire it, without ruining it for the future generations.